(Nanowerk Spotlight) Inorganic crystalline silicon solar cells account for more than 90% of the market despite a recent surge in research efforts to develop new architectures and materials such as organics and perovskites. 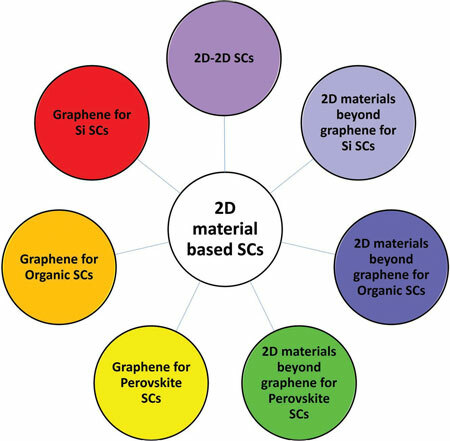 A recent review in Advanced Materials ("The Role of Graphene and Other 2D Materials in Solar Photovoltaics") provides a comprehensive overview on the current state-of-the-art of 2D-materials-based solar photovoltaics. 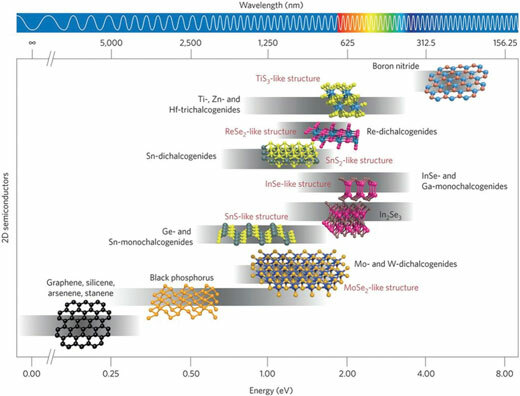 It describes the recent progress made with graphene, graphene-based materials, and other 2D materials for solar photovoltaics, including silicon-based solar cells, and organic and perovskite solar cells. The authors point out that "the idea of an all-2D solar cell may not seem very effective from a photovoltaic standpoint, since conventionally used active materials are a lot thicker, thus absorbing more sunlight. However, interestingly, such solar cells have the potential to surpass the performance of conventional photovoltaics based on Si and GaAs. TMDCs have a bandgap in the visible to near-infrared part of the spectrum, which makes them ideal for solar-cell applications." "Furthermore, being direct-bandgap semiconductors at monolayer thickness, they allow high radiative efficiency. This, when coupled to their significantly higher absorption coefficient per unit thickness (greater than Si, GaAs, and perovskites) makes them suitable for highly absorbing ultrathin photovoltaic devices. The strong absorption in atomically thin layers with sharp, clean interfaces allows the highest watt-per-gram utilization of the active material." Concluding their review, the authors present a brief outlook for meeting the challenges and requirements for next-generation 2D photovoltaics at low cost and high production rate. "We feel that graphene has already demonstrated tremendous research and industrial potential and can be imbibed into the standard technology roadmap of photovoltaics. One concern to this end is that it has to compete with established processes and supply chains for existing materials like silicon and indium tin oxide. However, we feel that materials with immense potential should always synergistically supplement and compliment, rather than compete, with each other."